Many teams in the NHL are entirely dependent on their goaltending. They live and die by their goalie, so to speak. A team could lose any one of its star players, but the worst thing that could happen would be to lose its starting goalie to injury. And on Saturday night against their rival Buffalo Sabres, the Toronto Maple Leafs lost goaltender Frederik Andersen to injury. Andersen left the game against the Sabres during the first intermission after being involved in a scrum around the crease that resulted in him being knocked in the head. He was removed from the game as a precaution based on concussion protocol. Later it was classified as the ever-vague upper-body injury. This put fans and media into an anxious frenzy as Andersen took to the ice in Monday’s practice. What was the injury? 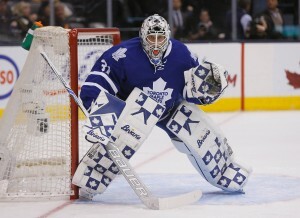 When will Andersen be back? Can the Leafs survive without him? But after Monday’s practice things seem to have settled down. Andersen’s injury is still unknown as usual with the tight-lipped Leafs management, but Dave Feschuk of the Toronto Star reported that Andersen has suffered a jaw injury. This would be concerning because Andersen suffered a jaw injury this time last year with the Anaheim Ducks. This kept him out until the last game of the season. So while it’s not expected to be long-term, it could keep Andersen out of some of the Leafs’ remaining eight games. Another possibility came during Monday’s practice. Andersen was working with goalie coach Steve Briere and Paul Ayotte, the head athletic therapist, came down to the bench and massaged Andersen’s shoulder as he had his arm raised. So there’s the possibility that it’s a shoulder injury, which has a history with Andersen like his jaw injuries. 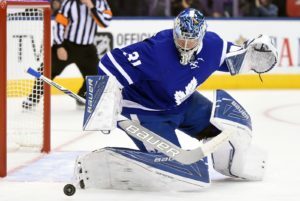 Andersen suffered a shoulder injury during the World Cup of Hockey that caused him to miss the rest of the tournament and the Leafs’ training camp. So it could be a jaw or shoulder injury, but we are unlikely to know based on how the Leafs have handled other injuries. After practice, Mike Babcock gave an update on just about everything. Andersen wouldn’t be playing against the Florida Panthers on Tuesday and Curtis McElhinney would be getting the start. Babcock also didn’t seem too concerned with Andersen’s injury, which would indicate that the team doesn’t see it as a long-term issue. So now it’s just a matter of waiting for Andersen to get the all-clear from the medical staff. Hopefully for the Leafs, he won’t be out of the lineup too long. McElhinney has played well for the Leafs in the limited amount of games he’s been able to play, with four wins in 10 games and a .919 save percentage. Although that is good, it doesn’t reflect his play over the course of his career, as he has a career save percentage of just .906. The Leafs could be in trouble if they have to go with McElhinney for an extended amount of time. Luckily there is relief coming from the Toronto Marlies. With Andersen out of the lineup, the Leafs needed a goalie to backup McElhinney, and Garret Sparks was the one to get the nod. Sparks got to play in a few games with the Leafs at the end of last season, but it wouldn’t be a good assessment of Sparks as a goalie considering how bad the Leafs were last season. In 17 games with the Leafs last season, Sparks had six wins, a 3.02 goals-against average and a .893 save percentage. His time in the AHL this season has been the complete opposite of his time with the Leafs. He is clearly the Marlies’ best goalie over Antoine Bibeau, who has struggled all season. In 26 games, Sparks has 18 wins, a 2.08 goals-against average and a .927 save percentage. Sparks is third in the AHL in bothgoals-against average and save percentage, so he’s the clear choice to call up to act as the Leafs’ emergency backup goalie. Kasperi Kapanen was also called up due to the injuries to Nikita Soshnikov (undisclosed), Josh Leivo (undisclosed injury) and Eric Fehr (broken hand). It seems that Babcock wanted to have a spare player on hand and didn’t want to use Ben Smith. So Kapanen will get to play on the fourth line against the Panthers on Tuesday night. Kasperi Kapanen plays tomorrow on #leafs fourth line with Brian Boyle and Matt Martin. This will be a big opportunity for Kapanen to prove that he deserves to be in the Leafs’ lineup. His chances will be limited as most are with fourth-line minutes, but with 18 goals and 43 points in 43 games, it will be up to him to show that he can bring that same skill from the AHL to the NHL. Along with his skill, he will also bring some much-needed speed to the fourth line. Kapanen will be an interesting player to watch. For now the Leafs will have McElhinney in net against the Panthers while we wait for more news about Andersen. Hopefully he will have a speedy recovery and be back in time for either Thursday’s game against the Nashville Predators or against the Detroit Red Wings on Saturday.